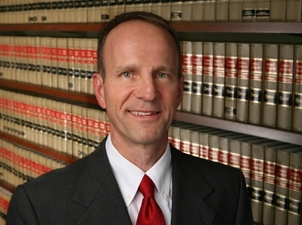 Karl R. Fink has been a partner in the firm since 1995. His practice includes all aspects of commercial litigation and intellectual property litigation, creation, management, enforcement, and licensing, with particular emphasis on patent litigation. Karl has been a full-time first-chair trial lawyer since 1981, handling hundreds of lawsuits in state and federal courts across the country, both at trial and on appeal. He represents numerous public and privately held companies, ranging in size from start-ups to Fortune 100 companies. Karl's litigation practice also includes the handling of inter partes reviews in the U.S. Patent and Trademark Office. Clients have sought Karl’s counsel in a wide variety of intellectual property, commercial, and tort litigations. He has served as lead trial counsel for patent, trademark, unfair competition, copyright, and trade secret actions and has handled patent infringement actions, both on the plaintiff's side and the defendant's side. Karl handles alternative-fee and contingent-fee actions, as well as traditional hourly fee matters. Karl has played a leading role in numerous successful patent enforcement and licensing campaigns on behalf of the firm's clients. Clients also rely on Karl for advice regarding infringement, validity and patentability opinions, IP valuation, joint ventures, IP licensing, and other related business decisions. Karl previously served as Fitch Even’s Managing Partner and is currently a member of the firm's Executive Committee. United States Gypsum Co. v. National Gypsum Corp. (D. Del. 2017–present). Representing plaintiff in patent litigation involving gypsum wallboard composition and manufacture. Limestone Memory Systems LLC v. Micron Technology, Inc. et al. (N.D. Cal. 2016–present). Representing plaintiff in patent litigation involving semiconductor memory devices. Vaxcel Int’l Co., Ltd. v. HeathCo, LLC, et al. (N.D. Ill. 2015). Represented defendant in patent litigation involving dimmable LED lighting technology. Resolved on a confidential basis. Somaltus, LLC v. Auto Meter Prods., Inc. (E.D. Tex. 2015). Represented defendant in patent litigation involving automobile battery testing and charging technology. Resolved on a confidential basis. Olivistar, LLC v. The Chamberlain Group, Inc. (E.D. Tex. 2015). Represented defendant in patent infringement action involving network control of garage door openers. Resolved on a confidential basis. McDavid Knee Guard, Inc. and Stirling Mouldings Ltd. v. Nike USA, Inc. (N.D. Ill. 2014). Represented plaintiffs in patent infringement action involving foam padding for sports apparel. Resolved on a confidential basis. Bullets2Bandages, LLC v. Caliber Corp. (S.D. Cal. 2014). Represented Caliber in defense of a trademark infringement action. Case was settled in six months with Caliber taking assignment of the registered trademarks. Milbon Co., Ltd. et al. v. Hair Color Research Group, Inc. et al. (N.D. Ill. 2013). Represented Milbon in this action for trademark infringement. Settlement negotiations resulted in an agreed permanent injunction and judgment being entered in favor of Milbon. "Protecting Trade Secrets In the Workplace," American Intellectual Property Law Association, Minneapolis, Minn., May 19, 2016. "The Impact of IPRs and CBMs on Patent Litigation," American Intellectual Property Law Association, Minneapolis, Minn., May 18, 2016. "101 Post-Alice: How the USPTO and Practitioners Are Reacting," Intellectual Property Law Association of Chicago/U.S. Patent and Trademark Office program at Techweek Chicago, IIT Chicago-Kent College of Law, June 26, 2015. "Intellectual Property as Business Asset: Where Is the Value and How Do You Find It?," Fitch Even Webinar, April 30, 2014. Presentation to the Society of Hispanic Professional Engineers at Northwestern University in Evanston, Illinois, focusing on the practice of law, the role of lawyers in society, and our system of justice, on behalf of the Institute for Inclusion in the Legal Profession, November 2011 (with Joseph Shipley). "How Far Do You Have to Look Under the Rock (to Find Invalidating Prior Art)?" AIPLA 2009 Annual Meeting, Washington, D.C., October 15, 2009. "Value Added Litigation," in Business Power: Creating New Wealth from IP Assets. Ed. R. Shearer. (Hoboken, N.J.: Wiley, 2007).